I was lucky enough to have some treasure from the Tate Gallery in London come to me as part of the National Gallery of Art’s exhibit – “Pre-Raphaelites: Victorian Art and Design, 1848–1900”. The Pre-Raphaelite movement began in the later half of the 19th century in England. They rejected the academic execution of art and sought to return to a more emotional, detailed, and colorful style. Compositionally they drew from 14th century Italian art, hence the association with art “pre-Raphael”. For me, the centerpiece of this recent exhibition was John Everett Millais’s Ophelia, a naturalistic and hauntingly beautiful piece. You may already recognize the painting Ophelia. Clearly people like it;it actually sells the most postcards at the Tate Gallery. It depicts the drowning of Hamlet’s love Ophelia who has had a mental break-down following the murder of her father by Hamlet. The event is only alluded to in Shakespeare’s play but here it has been enacted in a lush British stream bank. 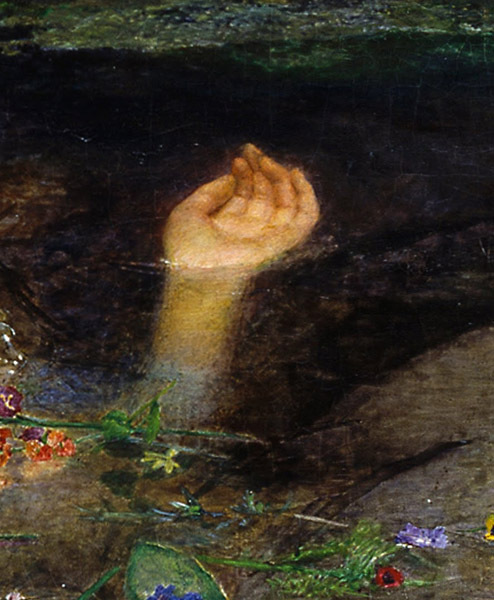 Shown floating just under the surface of the water, Ophelia does not appear to be actively trying to drown herself, nor does she appear capable of saving herself, thus creating a psychologically tense and dramatic image. Ophelia was an incredibly difficult painting to create. Working outdoors, Millais first completed the stream banks and forest. He labored 11 hours a day, 6 days a week, for 5 months to finish the landscape. While most artists at the time considered the outdoor setting of a painting to be tertiary to the figures, Pre-Raphaelite are known for their intense study and rendering of nature. The recreated image above shows how well composed and interesting the landscape alone would have been as a finished painting. I must admit, I never appreciated the landscape until I saw this painting in person. The detail and realism was incredible. While you can see the lushness of the river banks in reproductions of this image, in front of the painting the individual grasses, flowers and vegetation really pop. After completing the riverscape, Millais then brought the piece back to London. 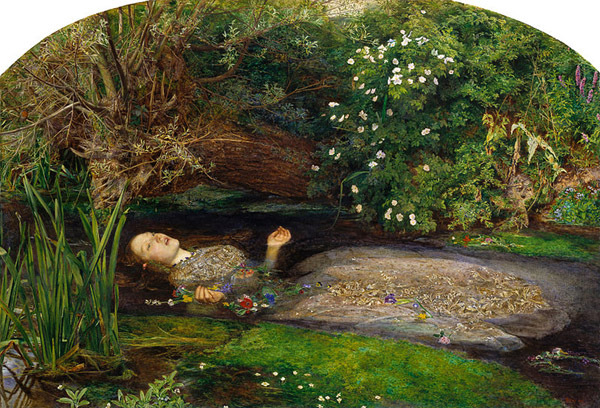 He used model Elizabeth Siddal (age 19) for Ophelia. Siddal later became of the muse and wife of Pre-Raphaelite master Dante Gabriel Rossetti. 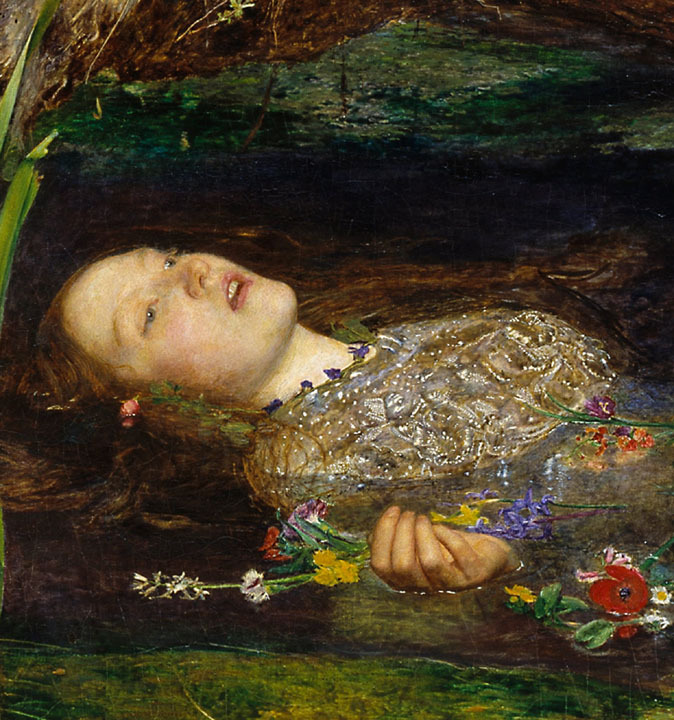 Dressed in a finely embroidered gown, Miss Siddal spent hours in a bath tub simulating Ophelia’s watery pose. Oil lamps were used to heat the tub but were not sufficient during the cold winter weather and she eventually became very ill. Although known for her fragile health, Siddal’s father eventually forced Millais to pay for her doctor’s bills. Much like Ophelia, Elizabeth had a tragic life. 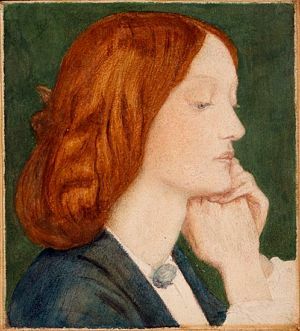 Following a tumultuous marriage to Rossetti (stoked by jealousy) and the death of their infant, Siddal died of an apparent drug overdose at age 32. 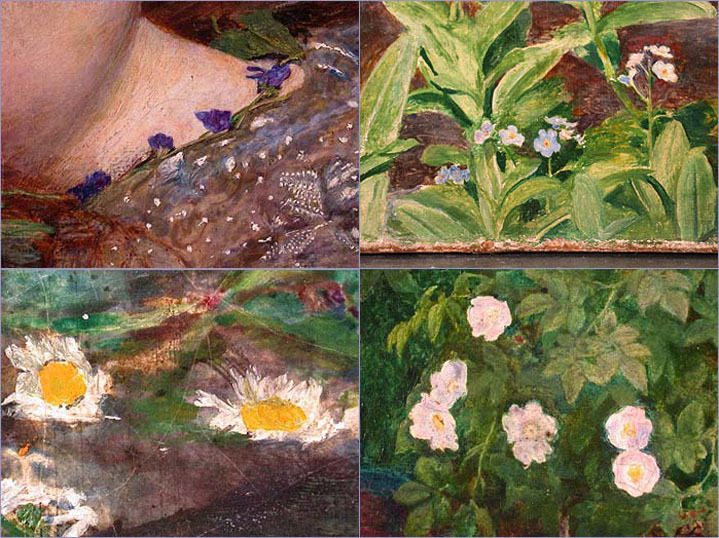 “Ophelia” is filled with symbolic plants (such as the forget-me-not and pink roses) and flowers explicitly mentioned in Hamlet (violets and daisies). Forlorn lovers and abandoned wives were popular subjects for Pre-Raphaelite artists. While contemporaries pulled from historical and legendary stories for their subject matter, the Pre-Raphaelite were the first to extensively use Shakespearean texts. Millasis paid careful attention and included flowers specially mentioned in the play. For example, in her disturbed state, Ophelia gives her brother a daisy and pansies before wandering off stage for the last time. These can now be seen scattered around her along with other flowers symbolizing youth, beauty, love and death. [One could write about] those water mosses, and the over making-out of the rose-leaves, and the abominable finish of those river-side weeds matted with gossamer, which the field botanist may identify leaf by leaf. I tell you, I am aware of none of these. I see only that face of poor drowning Ophelia. My eye goes to that, and rests on that, and sees nothing else, till-buffoon as I am, mocker, joker, scurril-knave, street jester by trade and nature – the tears blind me, and I am fain to turn from the face of the mad girl to the natural loveliness that makes her dying beautiful. — ”Our Critic’ Among the Pictures,’ Punch, 2 May 1852, pp.216-217. 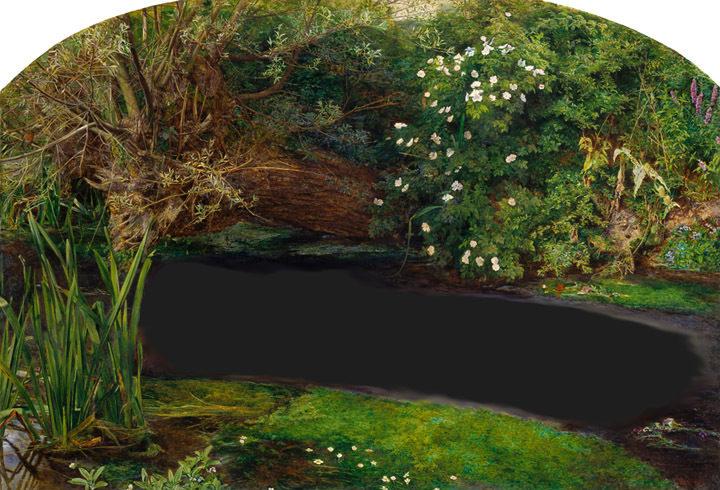 Ophelia is on exhibit in Moscow until Sept 2013 and then returns to the Tate Gallery in London. Great post on a spectacular Pre-Raphaelite painting, Christina. The quote from a period critic is so touching and apt; thanks for finding it. Thanks Lesley! I couldn’t top that quote, it was just too lovely and perfectly on point. I really enjoy the Pre-Raphaelite works but wasn’t exactly familiar with the backstory. Very well done and one of the most detailed and beautiful paintings I have yet to see. Great review of this iconic painting. I never read Hamlet in high school (I know…), so I missed the backstory for the details like the daisies and pansies. Interesting back story that I wasn’t aware of. The Pre-Raphaelites were a favorite of mine to study in school–their paintings are just so beautiful. Thanks! Besides the lovely paintings, the pre-Raphaelite artists had very interesting lives.